It seems like almost everyone has had some sort of personal experience with hacking, cyberattacks or malware these days, either at work or at home – and, for many, both. But did you know that Symantec, the cybersecurity software giant, discovered more than 430 million new unique pieces of malware in 2015 alone? That was up 36 percent from the previous year, and the numbers keep growing. 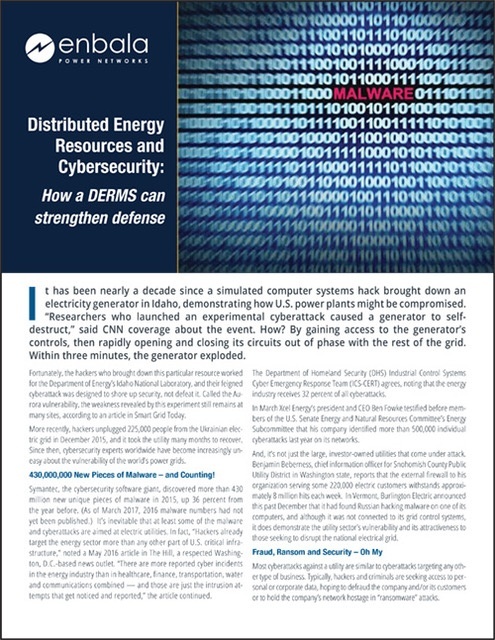 Anyone in the utility industry is also aware that utilities are a target for cyberattacks, but did you realize that hackers target utilities more than any other part of the U.S. critical infrastructure or that there are more reported cyber incidents in the energy industry than in healthcare, finance, transportation, water and communications combined?